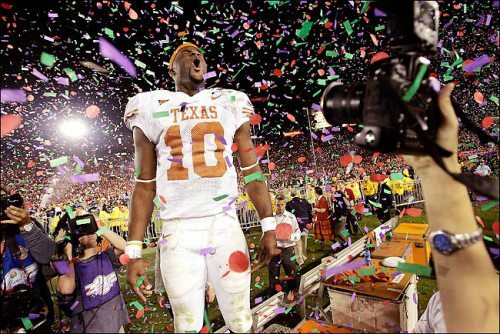 One of my sports idols, Vince Young, filed bankruptcy a week or so ago. You can click here to see some video of him leading the University of Texas to its first national championship in 35 years. I watch this video at least once a year to relive the joy of that moment. Vince went on to play pro football and was quite successful at it – click here – but is now out of the league and has hit a rough patch. Here is a news(-ish) report on the filing. Hearing this news caused me to reflect on how circumstances can change so drastically in life and reminded me of another quote I heard recently from someone even more famous and accomplished than Vince Young. 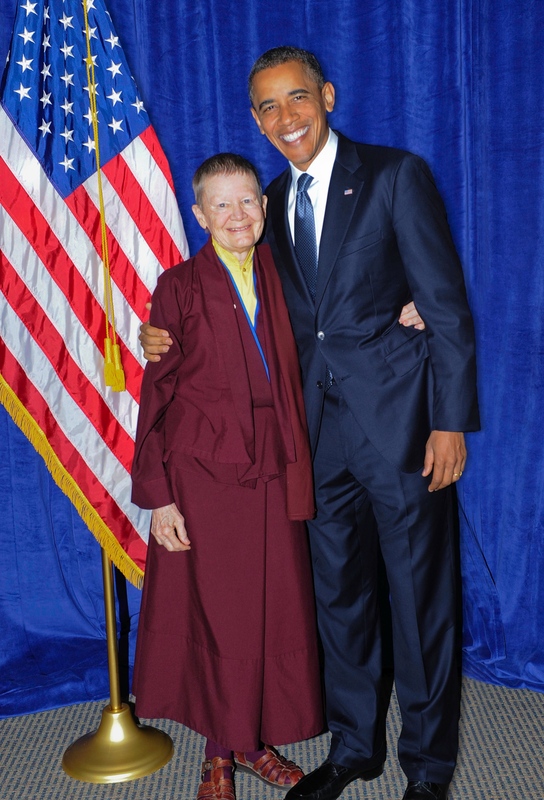 My meditation teacher, Pema Chödrön, is also a pretty big deal: a multi-million selling author and world-famous spiritual teacher (she is pictured here with someone you may have heard of. She doesn’t yet know that she’s my meditation teacher, but I’m hoping to meet her at a talk she’s giving in May and tell her!). Here she goes through her own slightly comical story of reduced circumstances. 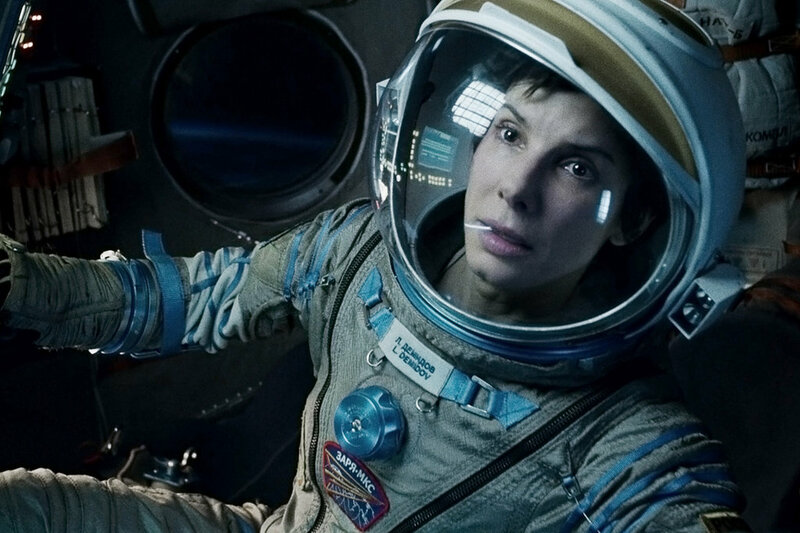 I think the lessons to take from all three stories, Vince’s, Sandra’s, and Pema’s, are that you are sometimes big and sometimes small, that you have to juggle those roles, and that there’s something to be gained from doing it gracefully. I am sometimes quite big. As a bankruptcy trustee, I am the only officer of the court most debtors and creditors ever appear before. It can be a very powerful position. However, I often deal with judges with more authority than I have, and many, many lawyers who are more accomplished than I am. As I pointed out in my very first post, I am small potatoes in so many realms, including in my own family (at home, the kids know well that Mom is the boss)! I try to carry the lessons from these other roles into my work as a trustee and a lawyer and remember that many debtors have been bigger than me and have fallen because they tried reaching for the brass ring that was just out of reach. Even if they were rich or famous at some point, they are not so different from me. We are both small pieces of an infinitely vast creation. I think the reason we struggle with this change of roles is that we become attached to being big – to deference, to certain surroundings, to mental and physical comfort. When we are not in our comfort zones, we suffer a little or a lot. Vince was a much better football player than he was a financial wizard. Sandra enjoys the limelight but worries about her child eating his lunch. Pema is a better speaker than audience member. In each case, the flipping of the roles brings a kind of suffering. To bring it back to a circumstance we as people involved in the legal world can relate to, a few days ago I counseled a friend of mine, another lawyer, who was annoyed when a client questioned him. The client is elderly and asked my friend to speak to the client’s son about the issue. My friend became indignant and made the assumption that the client didn’t trust him or thought the son was smarter than he is. Those are not the words the client used – he may have just been confused about the issues presented – but my friend’s mind quickly went there, and he created his own suffering through his attachment to a certain status: the competent, benevolent lawyer. When both his competence and benevolence were questioned, he became angry because he was attached to that role. I asked him to hear the words the client actually used rather than creating suffering through his attachment to his assumptions about the words the client used. He will be gentler to the client and himself, which, I think, is the first rule. In the end, I think this is another reason to have a meditation practice, to remove those assumptions about ourselves that can hinder our ability to be the bigger person. I think you’ve touched on something here that we all feel. We live in a world of expectations to be big – whether it’s wanting to live up to our parents hopes that we’ll be successful and important or our own internal insistence that we must be so. And still, we are often reminded that we are small – that the realities of every day are not made up in those “big” moments but in the “small” ones of parenting or dealing with finances or health issues. In some ways we create two personas – ourselves as big and small which you so aptly point out is hard to transition between. But, as you also point out, we can come to a point where we don’t have to transition between them or we can transition gracefully – accepting both the big and small as ourselves and in so doing find a more balanced psyche, letting go of the expectations that can stunt our growth as individuals. I’m struggling with something similar. Trying to get comfortable with not always being big. I’m trying to look at the small moments as teachers. They carry some message for me. As do the big, I am sure. But when I’m big, I feel too great about myself to try to listen. I’m much more willing to listen when it hurts. I would suggest your lawyer friend spend some time with the elderly (which has been my recent “adventure” as eldest daughter of a father in failing health) to learn something about patience and how to relate to elders if he plans to have them as clients. No other experience has taught me so much about the virtues of patience and forgiving others for their limited capacities. very true, Jeffee. I secretly envy people who are not patient in that way because it means they haven’t been through hard circumstances that would have forced them to change!